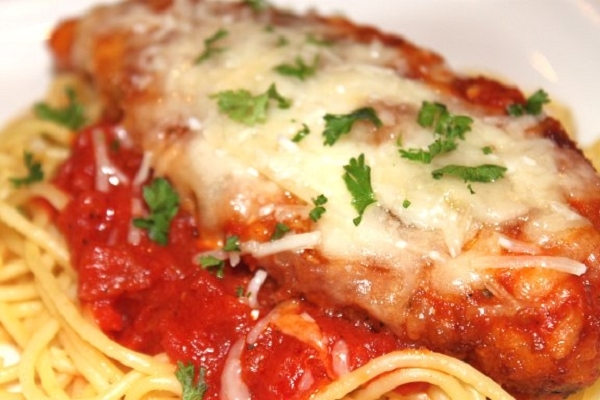 This is the Classic Chicken Parmesan recipe with a double cheese effect. Parmesan breaded chicken breasts are topped with a marinara sauce together with mozzarella and parmesan cheese and basil to boot. Served with a side of Spaghetti. Lip smacking good! Preheat oven to 350F. In a wide bowl, beat eggs until frothy. Pour flour in shallow platter and bread crumbs on a plate. Add 3 Tbsp oil to large skillet & heat on medium. Lightly dredge both sides of chicken in flour, dip in egg wash to coat completely, let excess drip off, dredge in bread crumbs. Cook each chicken for 2 mins / side & transfer to supplied pan. Cook in batches adding oil as needed. Spoon 2-3 Tbsp of marinara sauce over each chicken, add cheese then place in oven. Bake for 15 mins. One of Maria's best meals! Have been ordering meals from Maria for two years now and this chicken parmesan is truly restaurant quality. Great collection of ingredients and good instructions! This was surprisingly easy and had wonderful flavor. I would even call it restaurant quality. This will definitely be on my reorder list when it comes back around. Chicken Parm is one of my favorite dishes to get when we eat out at Italian restaurants, and this dish lets you have that experience at home. Quick and easy to make, this dish is great!! This is a great dinner meal. It is easy to prepare and always delicious! This was delicious. Loved it! 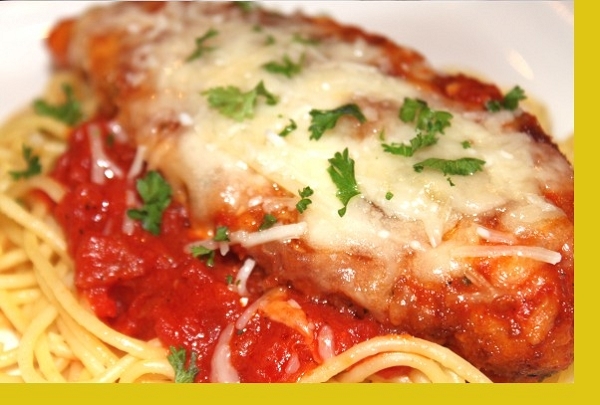 The great thing about chicken Parmesan is the crispy texture and the wonderful homemade marinara sauce! You do have to dredge the chicken cutlets in flour, egg, and fresh bread crumbs and sauté for 2 minutes each side!! Put in oven with dollop of marinara and mozzarella and cook for 15 minutes!! Yummy, fresh and over the provided spaghetti, just add a salad and voila!!! Love it!! This beat the chicken parm from my favorite Italian place. Delicious! The portion size was perfect - perfect amount of sauce and noodles. Yum! :) I would love for this to be served with a side salad, but I guess I could add that on myself. This dish took a bit longer for me to prepare since I had to have more items on hand for preparing and staging the chicken prior to cooking it. The marinara sauce was perfect. This dish is a little bit more preparation but the end result is delicious! This is definitely one of our favorites! The chicken Parmesan dish is delicious. Not only did my husband and I enjoyed it all my kids loved it as well. Will definitely order again. This is so good! Not restaurant quality but better! This takes a little more effort to prepare than some of Maria's dishes, but the results are impressive. My husband does not normally like chicken Parmesan, but, he really liked this.